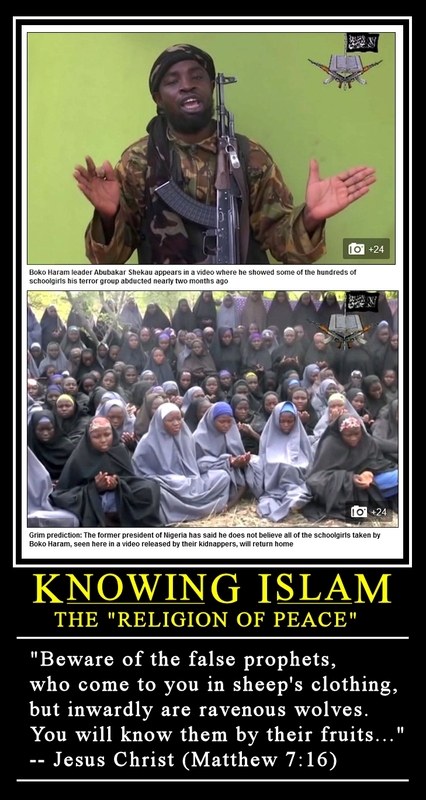 With pictures being worth a thousand words… I present to you the fruits of Islam. 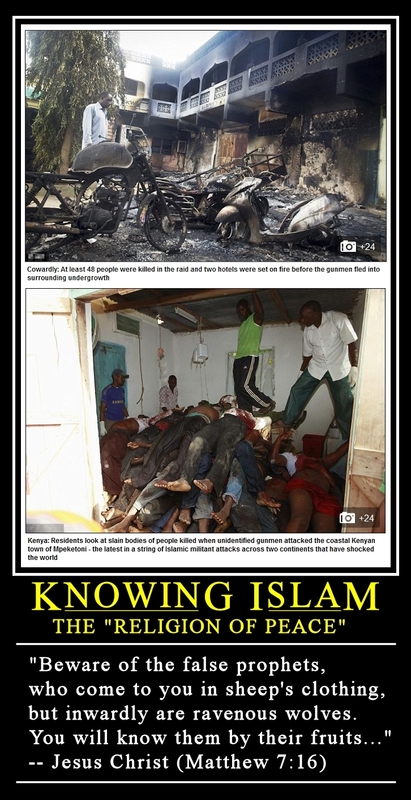 Are all who follow Islam evil? No, but the serve evil. At best moderate Muslims are irrelevant; but I’m not so kind. They actually empower the evil among them… just like the Germans in the 1940s made Nazi Germany possible. That little foray into evil only cost 20+ million lives. The difficulty can be when we have a modern mindset that says “all religions are equally valuable.” It would really be better to say “all religions are wrong” — to be a firm materialist, than to say the former. I’ve talked about this with my kids many times over the years. I’ve told them quite plainly that I have no problem with certain religions (Christianity, Judaism, Buddhism), but I do have a problem with others, especially those which treat women as second class (including Islam and certain branches of Christianity, Judaism, etc). In the early Greek church, women were leaders (see “Chloe’s people”). It was the later Roman church that kicked women to the curb, and the modern Roman church perpetuates this mistake. I have hopes for the new pope to move them past this, but we’ll see. Sorry, going on a tangent. My main point is, I don’t see how Islam can survive in the modern world. I expect Christianity and Buddhism to flourish, because they’re open (ie, they don’t require you to pretend you live in the middle ages or learn a foreign language to fully participate), and they aren’t inherently sexist (in most incarnations). 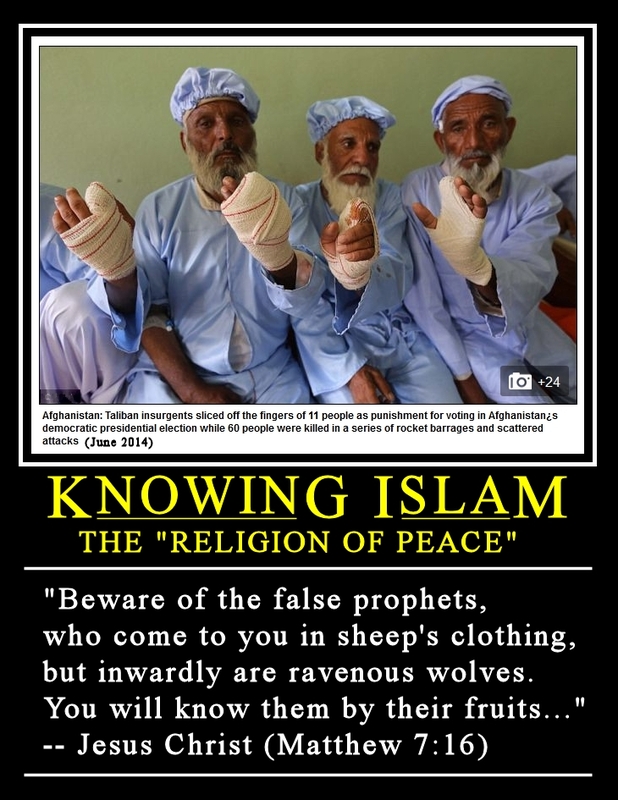 Islam has to go to war, because *no one will take it on voluntarily*. Even Iran had to be put under the Saudi sword to convert from Zoroastrianism. Long story, interesting history. But I expect this to be Islam’s last century. Sure, there will be some cultural remnant, but true Islam — I don’t see it making it into the 22nd century. The followers will get tired of being poor, repressed, isolated, and uneducated. That is indeed the worldly mindset. I’ve most heard it expressed “everybody’s right”. And it’s all in the interest of whistling past the grave yard. Pretending deep down, we’re all the same. It’s ignorant and stupid, and dangerous. I would much rather an atheist, or other religion to tell me “you’re wrong” than to pretend we’re one big happy world worshiping the same God. We’re not. >> My main point is, I don’t see how Islam can survive in the modern world. Agreed. But the alternative is also a real possibility; the modern world not surviving Islam or a resurgence of it. This possibility exists because the modern world would rather pretend the wolf in the woods is not there. It is our current direction, and we may actually do it until it is too late. >> I expect Christianity and Buddhism to flourish, because they’re open (ie, they don’t require you to pretend you live in the Middle Ages or learn a foreign language to fully participate), and they aren’t inherently sexist (in most incarnations). Only if we recognize the wolf in the woods and deal with it. I think our main disagreement is in how we see humanity and society progressing. I think you see it evolving towards a utopia; that we are evolving and improving generation to generation. I see humanity as unchanging (flawed) in the sense that we make the same mistakes over and over again. Our knowledge and thus technology change, but our nature is the same today as it was thousands of years ago and will be thousands of years hence (or until the Lord returns). >> Islam has to go to war, because *no one will take it on voluntarily*. As it has been for 14 centuries. Islam is a violent, oppressive “religion” just as its founder was. 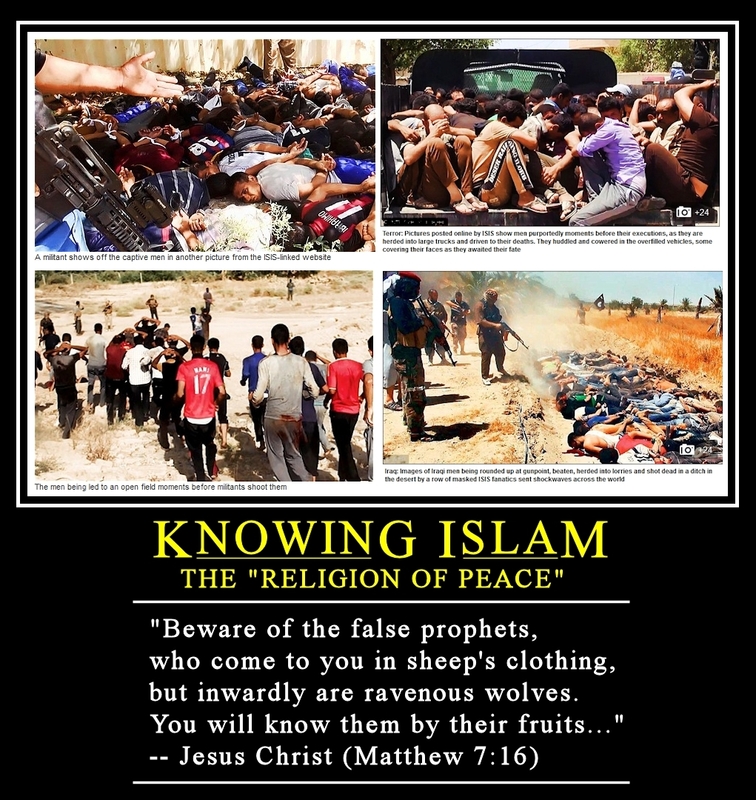 Those we call radicals are practicing Islam as Muhammad did… not the moderates proclaiming a “religion of peace” as the sit on their hands. They are simply the useful idiots, the peasants of this age just as Muhammad had them in his time. >> But I expect this to be Islam’s last century. Part of that progression of human society? Me too, actually, but only because I expect Jesus will return and settle the whole shootin’ match. Of course I don’t pretend to know that day… and will probably join thousands of men who were wrong about that. We all (Christians) think we see the end times approaching. >> Sure, there will be some cultural remnant, but true Islam — I don’t see it making it into the 22nd century. The followers will get tired of being poor, repressed, isolated, and uneducated. The followers will have little to say about it. They’ll follow or be lined up in a ditch and shot as an example to the next group of followers. Islam, Nazis, Romans? Nothing new under the sun… the only difference are the tools of destruction available. >I think our main disagreement is in how we see humanity and society progressing. I think you see it evolving towards a utopia; that we are evolving and improving generation to generation. >I see humanity as unchanging (flawed) in the sense that we make the same mistakes over and over again. Our knowledge and thus technology change, but our nature is the same today as it was thousands of years ago and will be thousands of years hence (or until the Lord returns). Yes, I’d say that’s essentially it, though I don’t believe in utopia, just improvement. And, I’ll admit that we go backwards sometimes in our attempts — for example, affirmative action, war on drugs, etc. Good intentions, some good results, but in the long run, big problems. Eventually, of course, this *becomes* an anti-Islamic thing, because the clerics won’t surrender power (Islam means “submit,” after all). That’s why they shut out the internet as much as possible, and imprison/execute journalists — even fellow Arabs working for Al Jazeera in Egypt. The free exchange of ideas across the internet will prove more powerful than military force, in the long run. But, short run… there will be more wars. It seems inevitable.